ROME – When Pope Francis insisted that the lives of the unborn and of the poor are “equally sacred,” he was not trying to shift the focus of Catholics from fighting abortion to fighting poverty, he was trying to show they are part of the same battle, said Archbishop Vincenzo Paglia, president of the Pontifical Academy for Life. 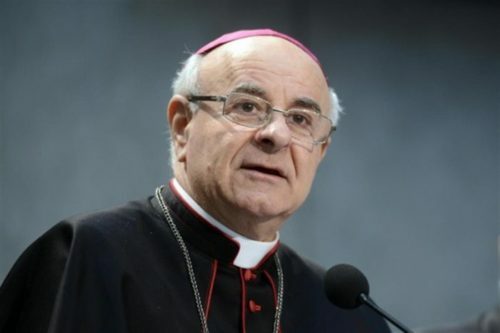 The life of the unborn must be “promoted and defended with great determination and given an effective priority,” the archbishop told Catholic News Service April 17. In Guadete et Exsultate, or “Rejoice and Be Glad,” his apostolic exhortation on holiness, Pope Francis wrote that living a Christian life involves the defense of both the unborn and the poor, and he criticized what he termed the “harmful ideological error” of thinking one’s own cause is the only important one. Francis’s words reminded many people of the “seamless garment” approach to life issues promoted by the late Cardinal Joseph L. Bernardin of Chicago. While applauding its recognition of the sacredness of all human life, some people criticized the approach, saying it could give people a mistaken impression that, for example, the church teaches abortion and capital punishment are equally serious sins. Others worried that some Catholics would claim their defense of life in one area meant that they did not have to pursue the protection of life in other areas. The pope’s words in the exhortation reflect the same vision the pope had in renewing the statutes and membership of the Academy for Life, he said; the pope believes “true support for life cannot be limited to isolated moments of its existence, but also must promote the conditions of justice and peace” life needs to thrive. By putting together abortion, euthanasia, hunger, immigration, the death penalty, weapons trafficking, war and other serious issues, he said, Francis makes it clear that all human life always must be defended.